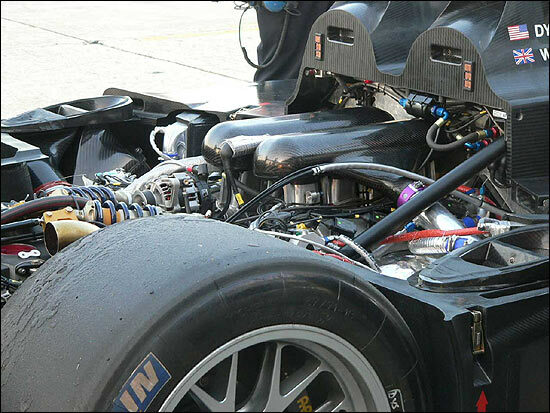 Dyson Racing tested at Sebring January 23-25, the first opportunity with the new Lola B06/10 and with the twin turbo AER V8. Both are new in every sense; it was the first time even the team had seen the new car and engine. For our readers it’s an opportunity to get little further behind the scenes of one of the top racing teams in the world. 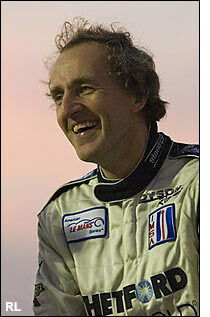 We will continue throughout the 2006 season with Dyson Racing Team features and event reports. The second annual Wheels Down Winter Test probably started on Monday January 16 for the Dyson Racing Team. That was the day that driver James Weaver pulled on his lavender – or perhaps they were pink – socks and trundled down the road to Lola Cars International, Ltd., in Huntingdon to “oversee final work on the pedals” in the Lola B06/10. On Tuesday, the car – nose and wing dismounted – along with a kit of spare parts, were delivered to London’s Heathrow Airport, where the chassis was put through two cycles over twelve hours in a decompression chamber – in effect simulating flight to altitude – a safety procedure mandated by the world in which we all now live. A bomb with an altitude trigger would detonate in the chamber, not in the aircraft. As the car was winging its way on Wednesday toward Florida, Vince Carr, the Dyson Racing Team’s transporter driver, was leaving Poughkeepsie, heading down Interstate 84 to 80, then to I 95 and I 4 to Orlando International Airport, where the Lola cleared customs and was loaded by noon on Friday, January 20. At about that same time, the rest of the Dyson Racing crew was boarding their flight for Florida at New York’s LaGuardia airport. 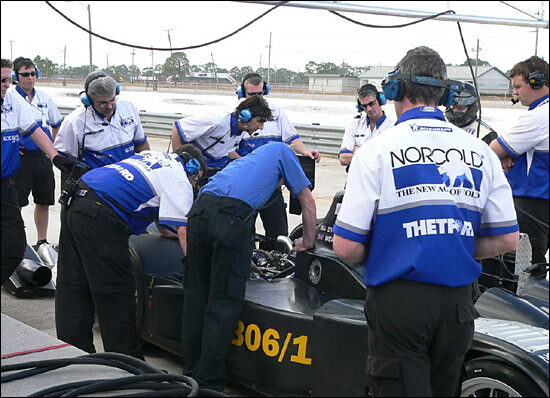 By Friday afternoon, then, crew and car were in Sebring. Largely completed thus far in the United Kingdom, the real work was about to begin in the colonies. On Saturday morning at 8:00 AM, the first order of business was to find somewhere to work; the track was closed to paddock set-up. Cliff Hauck is the most recent of a couple of “Dyson guys” who have worked for Skip Barber; his phone call to a buddy got the keys to the Barber shops. The nose and the wing were separate. There was a box of parts. The rest of it was “shrink wrapped” – wrapped in plastic, anyway. So the second order of business was to unwrap it. Then? “We stood around and looked at it,” said Dyson Team Manager Randall Kelsey. On Tuesday, just before shipping, Lola’s Sam Smith had said, "The car looks absolutely stunning, and incorporates some interesting details." The guys from New York were seeing that for themselves. But those few minutes of admiration were quickly done. The car went up on the high jacks, two-to-three feet off the floor, and all the bodywork was removed. Meanwhile, part of the crew inventoried the spares, comparing their result to the packing slip. The radio was installed. 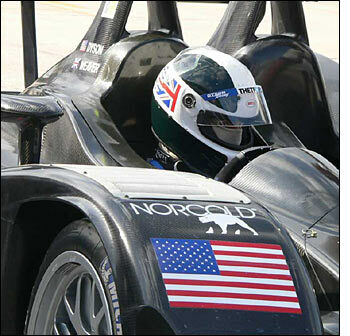 The Pi instrumentation and sensors – O2, tire pressure, ride height – were installed and tested. Gearing was changed. Part of the ‘heavy work’ to be done was heat shielding. The Dyson team’s experience has been with the B01/60, which “put out a huge amount of heat, so we did everything we could so we wouldn’t have a problem.” They shielded and insulated the headers, wiring, ducting, wherever their experience had taught them they should. In the end, they wouldn’t have a problem during the Sebring test. “It didn’t get as hot as I thought (it would),” said Randall, “but we never pushed it to 100%, either.” Better safe than sorry is a motto around here, it seems. Saturday was a wrap at about 8:00 PM. Sunday was underway (for the crew) twelve hours later. On Sunday, Randall split his team, one part to set-up “camp” in the paddock, and a few specialists to do basic “set-up” of the new Lola. The car went on the team’s scale at the Barber shop, where they could adjust corner weight, ride height, and otherwise create a neutral balance and stance. By afternoon, the tent was up in the Sebring racing paddock, and the car was on its way from its first North American home to its second – towed behind a van for the half-mile trip – still not under its own power, but the furthest trip on its own wheels so far. It was no surprise that there would be a few teething problems for a car in its shakedown; the surprise would be that there were so few. The first “hiccough” was on Monday morning. The AER twin turbo V8 would start, but “booting the throttle” would kill it. It seemed the pedal input (it’s a “fly-by-wire” system, with no physical linkage) wasn’t communicating properly with the engine throttle. Software? Not in this case. The engine had run on a dynamometer, but never in the car. The dyno has a 12 volt power supply; the car a 12 volt battery. The car needs a resistor that is not required on the stand. 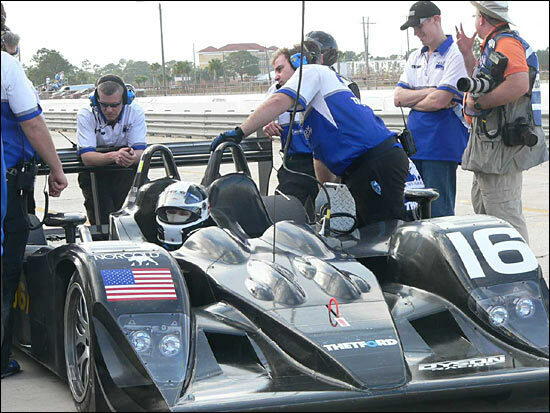 Once the diagnosis was made and the resistor wired, the Lola headed for the Sebring pits. That was during Monday’s third session. It was past 3:00 PM when the black carbon fiber Lola made its way, under its own power for the first time, from paddock to pit. From there it was six laps in the first hour for James Weaver. Software this time, programming the shifts, a necessary step, really, in a drive train combination that’s never spent any quality time together – on a track. Looking ahead to the American Le Mans season and a number of bumpy tracks, this isn’t the worst place to shake a car down, isn’t it? The Lola had not turned a wheel under its own power, not at Snetterton, not anywhere, until Monday’s third session. 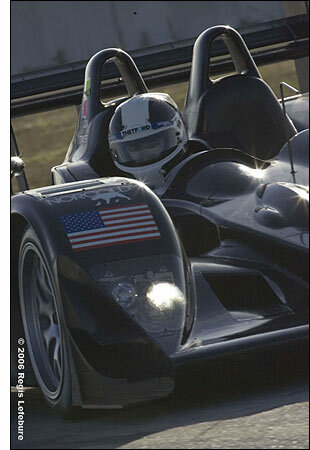 Still, the Dyson team was able to run twenty laps in the session. 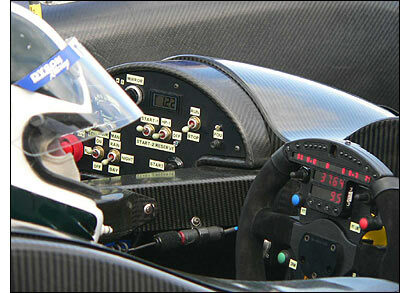 It started to come together in the last hour, James working the Lola down to 1:50.787 on lap sixteen. There was no shortage of help for the Dyson guys. Mike Lancaster was there for AER, with Technical director Oliver Allan. So was Julian Sole, the Lola’s designer. There were others, too, so that there would no lack of any technical expertise to deal with any problem, routine or extraordinary. It was back to the track for the first session Tuesday morning, from 9:00 AM to 10:30 AM. 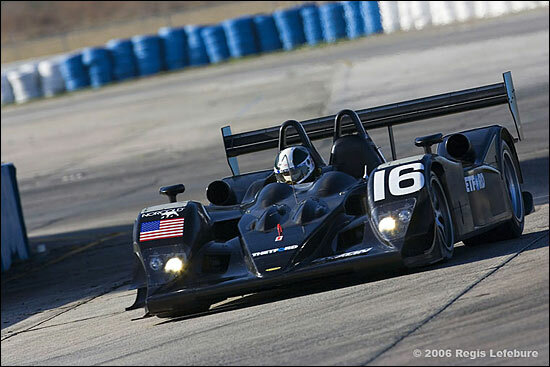 The new Lola B06/10 AER has plenty of downforce. Bottoming on the bumpy track – “sucked down” according to the driver, broke the boards, “skid plates” is a pretty good description, at the corners of the nose splitter. Those are attached by screws requiring hex keys, but a few had been stripped. It took some work, but the crew got it done, and Weaver bested yesterday with a 1:50.665 in the fifth of seven laps, before a suspected fuel leak caused a prudent “power off” on the course. That was the first report heard in the pits. The leak turned out to be an instrument error. With that glitch resolved, the Lola ran consistently in the 1:50s and 1:51s as James worked through a planned program, out for eight laps in the mid-day session. He explained that the first requirement is “housekeeping. You check all the systems; do they function at speed the way they are supposed to? Further on, we’ll check systems in a long run.” In the last session of the day, the car logged eighteen laps, with a 1:50.359 best. This afternoon, Chris Dyson confirmed they were reasonably on schedule as they packed it shortly before the end of the session to deal with “installation issues, something we could run with but there’s no point in it.” It’s back out tomorrow as the work continues. What is ahead? The second car is on the way, to be on hand when Dyson Racing joins Corvette Racing and Audi Sport North America at Sebring for their second test of the year, beginning February 6. Chris, Butch, Andy and Guy will have a chance to drive the new car(s) then. Chris Dyson wrapped it up. “We are running the car at normal speeds, but like James says, we are not on new tires: we are not optimizing the car for a lap time. We are basically doing systems checks and not concentrating on lap times.